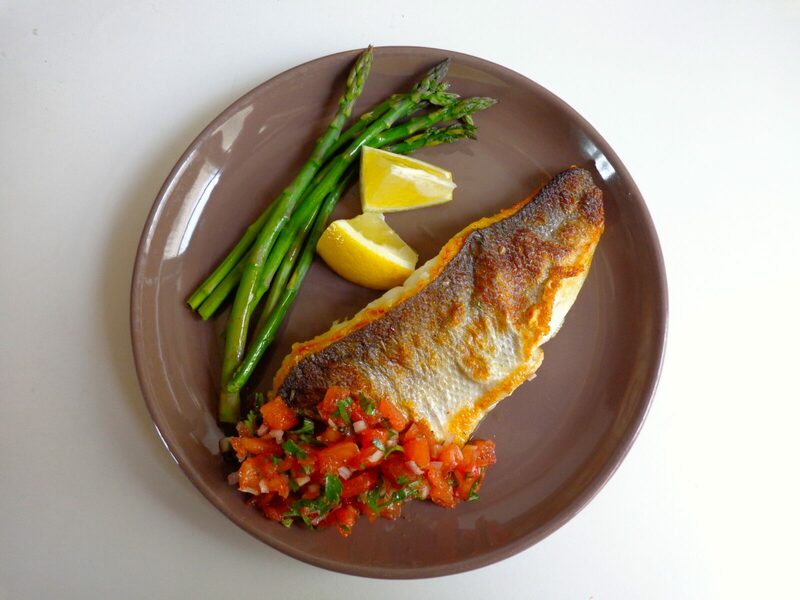 Sea bass is a highly prized fish in France. It is often grilled on a barbecue in summer with long, flowery fennel stalks for an aromatic flavor. But no barbecue is needed for this dish. The sea bass is pan-seared in olive oil and served with sauce vierge — a French salsa of tomatoes, shallots and fresh basil that translates literally as ‘virgin sauce’. With fresh veggies and a wedge of lemon, it makes a fine dish as we head into warm weather. But what about sauce vierge? I spent some time looking into how it got its name, but have not yet found an answer. Is it ‘virgin’ because it is uncooked (untouched by heat)? Because it calls for virgin olive oil? Or for some other reason? According to one theory, it may have been named for England’s Queen Elizabeth I, the Virgin Queen, who reigned from 1558 to 1603. But that is simply outlandish, if only because the tomato — brought from the Americas to Europe by the Spanish conquistadors — was not cultivated in Britain until the 1590s, and was at that time thought by the English to be poisonous. What I can say is that sauce vierge is quite popular in Paris these days, appearing often on bistro menus, usually to accompany fish. It clearly has southern roots, and by southern I mean Provence — or even Italy. It could easily be mistaken for the uncooked tomato sauce served over pasta by Italians in hot weather, topped with grated parmesan or ricotta salata. Over the years it has made its way north. But when did it first appear? Julia Child makes no mention of sauce vierge in her extensive compendium of French sauces in Mastering the Art of French Cooking, Volume 1, first published in 1961. (I don’t have Volume 2, so couldn’t check.) According to bits and pieces gleaned on the Web, the sauce was popularized in the 1980s by Michel Guérard, the guru of nouvelle cuisine. (His version used garlic instead of shallots, and tarragon instead of basil.) But if he popularized it, who invented it? If anyone out there has an answer, please let me know. And, in the meantime, happy cooking! This entry was posted in 5. 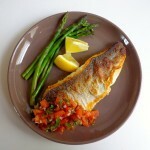 Fish and Shellfish and tagged filet de bar, French salsa, recipe, sauce vierge, sea bass. Bookmark the permalink.